The rupee on Tuesday gained 16 paise to end at one-week of high of 55.57 against the US dollar in line with firm equities amid sustained selling of the American currency by exporters. Forex dealers said a steep fall in dollar value overseas amid consistent capital inflows also boosted the rupee sentiment. At the Interbank Foreign Exchange (Forex) market, the local unit commenced higher at 55.55 a dollar against last weekend's close of 55.73. Later, it moved in a narrow range before concluding at 55.57, a rise of 0.29 per cent. Meanwhile, the BSE benchmark Sensex today spurted by 194.18 points to end at over five-month high of 17,855.26. 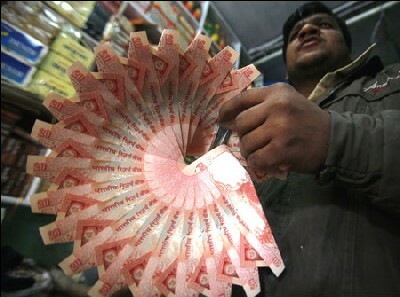 "Rupee appreciated today on the back of strong equity market, Asian currencies and euro. There was also bit of selling of dollars by corporate houses," Hemal Doshi, currency strategist at Geojit Comtrade, said. However, the appreciation was not sharp as oil importers bought dollars from the market possibly due to the announcement of strike by some public sector bank employees, he said, adding that going ahead, rupee is showing an appreciating bias. Meanwhile, retail inflation, based on the Consumer Price Index (CPI) declined marginally to 9.86 per cent in July, from provisional estimate of 10.02 per cent in June. Foreign Institutional Investors (FIIs) infused $58.02 million on last Friday, taking a total to over $11.43 bn in the current calender year till August 17. Continued dollar selling by exporters and some banks on hopes of further fall in dollar value overseas also aided the rupee rise. The dollar index was down by 0.44 per cent against a basket of six major global currencies, while the New York crude oil was trading just below $97 a barrel in Europe.